A lot of job seekers don’t know about it, but the UN has been hiring home-based workers for years. In fact, 60% of its staff work away from HQ, all over the world. With about 44,000 workers — many on short-term assignments — it has jobs and freelance gigs opening up all the time. If you like the international side of things, one of these openings might be a great fit. Although peacekeeping puts the UN in the headlines, it has about 40 programs and specialized agencies. These include the UN Development Programme, the Office for the Coordination of Humanitarian Affairs, the Office of the UN High Commissioner for Human Rights, the UN Environment Programme, and others. You’ll find many listed here. 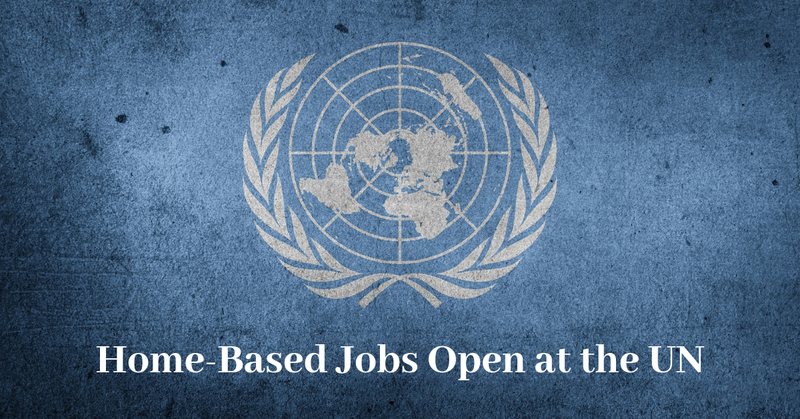 The central UN jobs database isn’t easily searched by keyword, so it takes time to find the home-based openings. The largest number of home-based jobs I’ve found is at the UNDP (the United Nations Development Programme), so this post focuses on that jobs database. The UNDP is the UN’s global aid network. It aims to reduce poverty, deal with large-scale crises, fight HIV, etc. The easiest way I found to search the UNDP jobs database is to start at the world development page. It has lots of useful detail for working at the UNDP. Once you’re oriented, click on View Current Vacancies. This takes you to the UNDP jobs database. If you search the database with the term “home based” with quotes, you get over 92,000+ results globally. But many of these are expired listings. It’s easier just to scroll down on this page while looking to the right — next to APPLY NOW — for the words home-based or home based. (Or do a keyboard page-search shortcut.) You can also look on the left and select jobs by group (Crisis Response, Gender Equality, Management, Democratic Governance and Peacebuilding, etc. ), then check listings on the right as mentioned. You can also select jobs by location (for US jobs, click on HQ and Other), then check listings on the right. A current sampling of home-based jobs includes a variety of Consultant, Specialist and Expert positions. And if you have a yen for travel, many of these jobs will satisfy it! The mix changes often, so if you don’t see something you like, check back regularly. For more jobs like these, see our Newest Jobs & Gigs page. To be the first to hear about jobs like these, like our Facebook page. Good luck in your home-based job goals! This entry was posted in International Home-Based Jobs and tagged United Nations. Bookmark the permalink.